Dr. Jeffrey R. Uzzilia graduated from Siena College in 1998 and from Albany Medical College in 2002. He then completed an internship and residency in internal medicine at Albany Medical Center. Following his residency, he completed a fellowship in cardiovascular disease at Albany Medical Center in 2005. Dr. Uzzilia is board certified in internal medicine, cardiovascular disease, nuclear cardiology and echocardiography. He is a Fellow of the American College of Cardiology, and Fellow of the American Society of Echocardiography. Dr. Uzzilia is the director of the echocardiography laboratory at Capital Cardiology and the Chief of Noninvasive Cardiology at St. Peter’s Hospital. He practices at both St. Peter’s Hospital and Albany Medical Center. 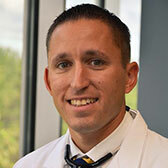 Dr. Uzzilia has a broad interest in general cardiovascular disease. He has a special interest in coronary artery disease treatment and prevention, congestive heart failure, and noninvasive cardiac imaging. He lives in Guilderland with his wife and three children. When he is not practicing cardiology, he enjoys spending time with his family, playing tennis, and watching Siena basketball.